When we think about ultrasound, the most common image that comes to mind is an ultrasound to view a baby within its mother’s belly. Ultrasound is also a commonly used modality in physical therapy, and the purpose is not strictly to view structures in the body. Ultrasound is commonly used to treat conditions like bursitis, frozen shoulder, plantar fasciitis, muscle strains, sprains, or tendinitis. 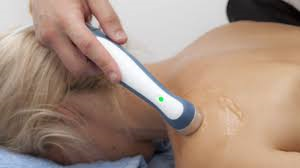 Ultrasound can be helpful for healing most soft tissue injuries or conditions. If you are a candidate, your therapist will use ultrasound in conjunction with active therapy, maximizing healing benefits and getting you feeling and performing better as quickly as possible. In the physical therapy setting, an ultrasound machine transmits therapeutic high or low frequency sound waves into tissues. The sound waves are produced by a special piezoelectric crystal that vibrates rapidly when electrified. These sound waves are transmitted into the body from a wand or sound head. The settings on the ultrasound machine can be adjusted by your therapist to provide different effects: deep heating or non-thermal effects. Ultrasound waves penetrate tendons, ligaments and muscles creating a deep warming that helps to decrease tightness and pain. Your therapist may use ultrasound to warm up tissues that are tight prior to stretching, allowing for improved range of motion with greater ease and less discomfort. The warming effect also dilates vessels to increase circulation and thus assist healing. Ultrasound also has non thermal effects that are believed to speed the body’s healing on a cellular level. Ultrasound introduces energy into the body which causes microscopic gas bubbles that are already in the body to expand and contact rapidly. This movement, or “cavitation”, is thought to speed cellular processes and assist the body in healing more quickly. What is an Ultrasound Treatment Like? Your therapist will select the most appropriate settings for your specific injury and stage of healing. Then, a small amount of gel will be applied to the skin of your injured area. The wand or sound head is then moved over the area in a circular motion. Ultrasound may also be applied in combination with electric stimulation, in which case, your therapist will also apply electrodes to the area. 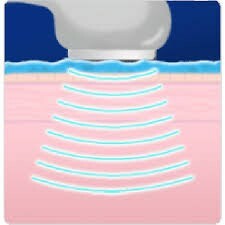 You may not feel anything at all during the treatment, or a light warming or tingling sensation. If you feel any pain during the treatment, tell your therapist immediately. Ultrasound is a modality that has been shown to decrease pain and improve healing with many soft tissue injuries. Therapists at Pro Physio are trained to skillfully apply ultrasound along with active rehabilitation to help you achieve your recovery goals.